"I choose you as champion!" Shazam!, the goofy Fawcett Comics golden age story with its own complicated history, tells the tale of a runaway foster kid emboldened with the magical powers of an ancient wizard when he shouts his name. Its joyous film adaptation proves to be a surprisingly entertaining and original take on the contemporary superhero genre told with the wisdom of Solomon, the strength of Hercules, the stamina of Atlas, the power of Zeus, the courage of Achilles, the speed of Mercury. Essentially a post-modern Big meets Superman, brooding Philidelphia teen Billy Watson (a lively Asher Angel) turns into a super-powered big red hero (a perfectly sarcastic Zachary Levi as the original but since renamed Captain Marvel). Director David F. Sandberg somehow manages to deftly balance the tricky tone with energy and verve through coherent, mannered direction. It feels like a similarly self-referential yet family-friendly Deadpool aimed squarely at kid humour that refreshes DC Comics' storytelling. At its core, the film is about blended families with Batson's foster siblings grounding the emotional beats of the adventure. Jack Dylan Grazer steals the show as Batson's superhero-obsessed foster brother, Freddie Freeman, and acts like his charming sidekick meets mentor co-conspirator. His and Levi's comic chemistry joking around is never not funny. Child actress Faithe Herman is one more ultra adorable scene stealer as another of Batson's fast-talking foster siblings. 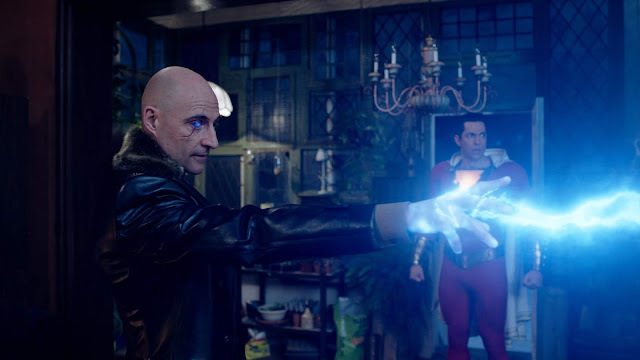 A crackling Mark Strong as the evil Dr. Sivana commands the Seven Deadly Sins, supernatural gargoyle creatures straight out of Ghostbusters that harness destructive powers, and is given a worthy familial backstory that Strong tries to underplay despite a hammy performance. The more subdued cast of welcome but lesser known players makes the focused story of superhero discovery all the more charming including a heavily made-up but commanding Djimon Hounsou as the titular wizard. What's further refreshing is how the action, set in the DC Universe, is its use of superheroes to explain its own story to both the audience and other characters within the film. Henry Gayden's basic script is structured in both a straightforward and inventive manner to frame parallel stories together to avoid some of the usual expositional origin nonsense or overlap. Shazam! is also strangely effective in how it depicts the actions of adults traumatizing children. Parental figures play a huge role showing the consequences of both selfless and selfish actions in how they can affect adolescent development. There are a few fairly dark tones about child abandonment with unexpected depictions of angry or neglectful parents to set the emotional stakes. The heartfelt Shazam! is a knowing superheroic delight with personality to spare. Its grounding in foster families and teenage wish-fulfillment is a refreshing antidote to other comic book fare. The film is surprisingly sentimental (in a good way) with goofy but endearing twists that highlight the irreverent fun of depicting a blended family of superheroes. Its modest but offbeat aims are what make it so appealing.